Due to the exposure of several Dana Westone custom guitars on Ebay, I think it is time to tell the story of how my relationship with Westone and St. Louis Music (SLM) came to be. In 1986, a sales representative of SLM began bringing his string instrument samples into my guitar shop for basic set-ups prior to showing them to his customers. He also would bring in the latest and greatest of his Crate amplifier samples. My staff and I would demo the products and show the rep. some sample settings that he could use when presenting the product to his customers. He would often comment on how the tone of the Crate amplifiers had “sparkle” when they were demoed in my shop. That sparkle was not audible from those amplifiers when demoed with the same model instruments in other stores. I explained that the instruments in my shop had Detonator pickups and an active mid range control installed in them for sales demonstration purposes. All designed by myself and sold exclusively at my shop. Expressing curious interest in the product he asked if I ever thought of producing the product nationally. Now I was curious…. (let’s see… hmmm… thousand’s instead of tens… my name perhaps in a nationally distributed catalog….) OK! Eventually, I was put in contact with the Westone product manager at SLM. The rest is history. Now, before I go any further I want to back up a bit. In the early 80’s, I had a customer that owned a mid 60’s Gibson SG. The bridge humbucking pick-up was very unique in tone compared to similar models from that era. It had bass punch, a unique mid range dip at 1K and a Tele style bridge pick-up crispness in the top end. The voltage output was also weak for that style of humbucking pick-up. The customer loved the sound of this pick-up and knew it was a one of a kind piece. But he wanted that tone with more out-put. At the time he was playing in a popular band in the local area and wanted all his “humbucking” style guitars outfitted with the same unique pick-up but, again, with more out-put. Great, but where was he going to purchase THAT pick-up? There was nothing like it on the market. I had been making pick-ups for my personal instruments for years. I actually made my first one in the late 60’s, when I was a young teenager. My customer finally persuaded me to try and duplicate a series of pick-ups for him based on the sound of the aforementioned humbucker. I nailed the first one down in about a week using a mix of modified bobbins and magnets from other pick-ups. I knew I had to make at least 12 units and that amount of construction time was not practical. I had a wonderful relationship with the DiMarzio Company at that time. I sent up a sample to the incredible pick-up inventor Steve Blucher and with in about two weeks I had some working proto-types. After a few weeks of testing, I had a bridge and a neck pick up for my customer. Mission accomplished and a very happy customer. Eventually, I installed a set into one of my Dana guitars. By adjusting the middle three bands of a Roland 6 band EQ, I found it very easy to get a wide variety of top 40 tones. But, that was not an efficient way to quickly adjust the mid range. It needed to be done from the instrument. With the help of an engineer friend of mine we developed a variable mid EQ sweep to naturally fill in the mid range gap of the pick-up. The Detonator pick-ups and mid range control were born. From 1984 until 1989 Dimarzio manufactured the pick ups as a proprietary pick-up for me and I manufactured and installed the circuits in house. Now, back to the continuation of the Westone Dana years. In the spring of 1987, I was introduced to the Westone product manager. I was already familiar with the Westone line. I respected their quality and understood that they were manufactured in Japan. We agreed that he would send me an instrument of his choice and I would install the Detonator pickup system for him to review. He sent me an embarrassment of a guitar from the SLM accessory department. The man wasn’t going to risk a good instrument on a guitar builder he had never heard of, despite my growing list of celebrity clients. I believe the guitar was a Series 10 Charvel copy with two humbucking pickups with a pitiful tremolo. In the shop it went and a day later after a new set of frets, the complete Detonator system and countless other modifications, the instrument played and sounded like any other $1000.00 instrument of its time. Except that it was made out of plywood, not solid wood. Ah, the beauty of that system. I brought that instrument to the 1987 summer NAMM show in Chicago. By January of 1988, the Westone Guitar Line was showing a series of Dana guitars at winter NAMM. The 1988 models consisted of two Japanese made instruments and one Korean instrument with a Floyd rose licensed tremolo. The colors were limited to white, black and red. The tremolo models sported a humbucking and two single coil pick-ups. The non tremolo version had two humbucking pick-ups. All the instruments especially the Japanese models, were extremely well made. Also, at this time the Detonator pick-ups and mid range control system were renamed. The pick-ups became signature ‘Dana’ pickups and the mid range control system was renamed DSR-5. I can’t remember why the five was used in the name. In the fall of 1988, the Artist Relations director at SLM asked me to hand make a series of custom guitars. These instruments were to be designed to attract the established “Guitar God’s” of the 80’s away from their existing supporters and into the Westone family. By the time the 1989 winter NAMM show rolled around, I had made at least 10 guitars and 3 basses. Many of these instruments sported paint techniques never sprayed on wooden instruments prior to their showing. They all had traditional pick up configurations, some outfitted with Dana pickups and DSR-5 electronics. In others, I installed popular pickups of the era. Also in the line up were two hand carved alder body instruments. 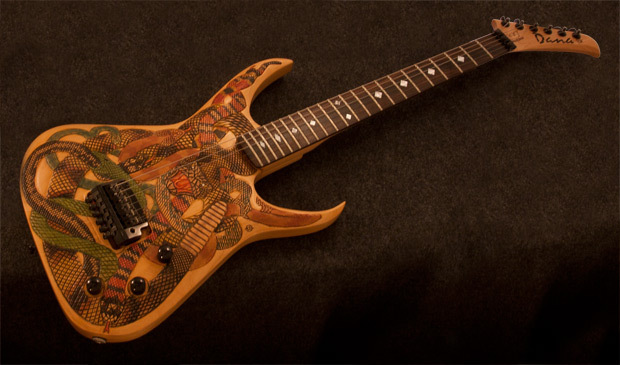 The “Snake Guitars”, aptly named because the carvings on their bodies were exact duplicates of about 6 different species of snakes entwined around one another. The center snake, which is a rattle snake sported Diamond eyes. These instruments had some of the first self contained piezo, in the bridge saddle pick-ups. One made by the Schaller Company, for the bass, and the other made by Kahlor Tremolos. Each individual saddle on the bridge contained an embedded piezo pick-up with its own out-put wire attached. Dana hand carved snake guitar. I didn’t want to sacrifice the carvings, so I wanted to go with this new bridge technology. To tame the inherent brittle tone of the piezo pick-ups, I had to design some tricky electronics. For the bass bridge, I first designed a miniature 4 way adjustable EQ system. This was to be used as an over all master EQ, hidden in the control cavity. Then I incorporated a 2 way (bass and treble) EQ to be installed outside the instrument. This design of electronics was used again in 2 additional custom basses. All used the Schaller piezo bass bridges. The 4 way adjustable EQ was so successful for the bass that I decided to use it for the guitar as well. I simply changed the frequency points to make the piezo’s sound more like a humbucking pickup. I then added a DSR-5, along with a traditional passive tone control on the outside of the guitar. I found the guitar to sound best as a clean instrument back in the day. But, with today’s processing it could be used in any sound format. The tremolo function was rendered useless. The piezo saddles picked up to much mechanical noise. So I just locked it down. In the summer of 1990, I brought the first proto-type of the yet to be named Alvarez Dana Scoop to the summer NAMM show. Pictures of this guitar can be seen in the instrument gallery. If you look closely you will see that the name on the head stock has a small Westone logo along with my name. That was my custom Dana Westone guitar for that show. I just wanted to wow the rock stars with the wild cutaway when they came by the booth. The president of SLM asked me not to show that wild cutaway to the public that summer. He thought it might be a patentable design… He was right. Please see the Alvarez Dana Scoop article on this site. After the Scoop was developed into a production guitar, the Alvarez electric guitar line was born and the Westone name was sold. In 1883 Edison discovered that electrons would flow in an evacuated lamp from a suspended filament. Years later, in 1905, Fleming expanded on Edison’s discovery with his “Fleming Valve”. But when Dr. Lee de Forest added a third component – the grid – to Fleming’s Valve in 1907, he opened the door to the world of electronic amplification with the development of the vacuum tube. During World War II intensive research of the detectors used in radar systems led Bell Telephone Laboratories to the invention of the first point-contact transistor. This reliable little device gained quick support as the new component for amplification. The death of the vacuum tube seemed imminent as designers, scientists, and engineers reveled in the idea of replacing large, fragile glass tubes with these small, rock-solid devices. However, there were (and still are) many serious listeners who realized that the sound produced by a “transistor” amplifier differs greatly from that of a tube amp – even in amplifiers that were otherwise identical in design specifications. These new solid state devices often produced a sound that was hard brittle and lifeless compared to their tube counterparts. It was determined that solid state devices produced a different, less musical set of harmonics than tubes. When pushed past their limits, they tend to mute the tone and emphasize the distortion. Tubes are not that way: they produce a more musical set of harmonics, the intensity of which can be controlled by the player. This characteristic adds a warmth and definition to the sound which has become the trademark of tube amplifiers. When pushed into clipping, the harmonic overtones can be both sweet and pleasing or intense and penetrating, depending on the musician’s musical taste and playing technique. Over the years, applied technology has resulted in a number of outstanding solid state amplifiers which sound very, very good. Some use special circuitry which enables them to simulate the distortion characteristics of tube amps. There is no argument against the reliability and consistency of these “maintenance free” units. Nevertheless, the tube is still held in the highest esteem by many thus establishing a successful melding of old and new technologies resulting in musical equipment offering musicians that classic “vintage” tube sound in a contemporary market. There are basically two types of tubes in a tube amp: Preamp tubes and power tubes. The Preamp tubes are smaller; usually types such as 12AX7, 12AU7 or 12AT7. These are the tubes that shape the sound and amplify the signal of your instrument. Preamp tubes tend to be micro phonic; that is they can mechanically pick up and transmit external noises. Since these tubes are in the first stages of an amp’s circuitry, it is very important to use high quality, low noise/low micro phonic preamp tubes. Although tubes of this quality may be difficult to find and can cost a bit more than micro phonic tubes, the added investment is worthwhile. It is extremely important to use a 12AX7 tube of this caliber in the first gain stage of an amplifier (where distortion is set) as well as in each high gain stage. Tubes are made up of a number of separate mechanical components that have been vacuum-sealed in a glass envelope or bubble, making them somewhat fragile. Various factors, such as how hard and how often an amp is played, vibration from the speakers, road travel, and repeated set up and tear down all contribute to reduction of the tube’s longevity. Any time you notice a change in your amplifier’s performance, check the tubes first. With the power off, carefully examine the tubes in a strong light and check them for cracks or white spots inside the glass or any other apparent damage. Then, with the power on view the tubes in a darkened room and look for preamp tubes without glowing filaments (like light bulbs that have burned out) or power tubes that glow excessively red. Since the power tubes work harder in an amplifier than the Preamp tubes, they are nearly always the first to wear out. If the sound from you amplifier starts to grow weak (lacks punch, fades in and out, loses highs or lows, or produces unusual sounds), the power tubes most likely need replacing. Since power tubes work together in an amp, it is crucial that they all be replaced together with a matched set of the same type. If worn out power tubes aren’t replaced they can ultimately fail, possibly causing severe damage to the output transformer and other components of your amplifier. If you notice your amp acting “funny”, especially if it’s been a while since the tubes were replaced, a checkup is recommended. This could save a lot of trouble by establishing the need for replacement before the tubes fail completely. If your amplifier squeals, makes noise, loses gain, starts to hum, lacks “sensitivity”, or feels as if it is working against you, the preamp tubes may need replacing. Remember to use only good quality, low micro phonic tubes in the preamp section. Whenever you replace the power tubes, replace the driver tube(s) as well. This is the preamp type tube which controls the power tubes, and has to work almost as hard as the power tubes. As a suggestion, if you’re on the road a lot, it might be a good idea for you to carry a matched set of replacement power tubes as well as a spare driver tube. Power tubes require a certain voltage setting (referred to as the bias voltage) in order to perform properly. The factory will set the bias according to the type of power tubes the amp is equipped with. Whenever tubes are changed the bias voltage must be checked and readjusted as needed to accommodate the new tubes. Even if the replacement tubes are of the same specifications as the originals, their operating parameters may differ enough to require bias adjustments. If the bias is set too low, the power tubes will run hot (the plates inside the tubes may glow red due to excessive heat) and the sound from the amp will lack power and punch. The excessive heat greatly reduces tube life; to a matter of days or even hours in severe cases. If the bias is set too high, the sound from the amp will be distorted at all levels. For the best performance and longest tube life, proper biasing is imperative. Even if your amplifier doesn’t exhibit any of the symptoms described above, the bias should always be checked after tube replacement since tubes can often have different performance characteristics even if they have the same part numbers. Match the impedance of your speaker cabinet(s) to your amplifier. Improper impedance matching will contribute to tube wear and can be a cause of premature tube death. Make sure a speaker connection has been made before switching on the amplifier. Allow the amplifier sufficient cooling time after playing before moving it. Properly cooled internal components are less susceptible to damage caused by vibration, thereby prolonging tube life. An amp that is physically cold should be allowed to warm up to room temperature before it is switched on. Heat generated from within the tube can crack the cold glass housing. Replace output tubes on a regular basis; before trouble starts. Typically, this means at least once per year. If you play long and hard, every day, tube replacement could be as often as every 4 to 6 months. Always have the amplifier’s biasing checked after replacing the output tubes (even if the amplifier is equipped with “self-biasing circuitry”). This should be done ONLY at a qualified service center. Improper biasing could result in the tubes running too hot, which greatly reduces the life of the tubes – or too cold, which results in distorted sound regardless of level settings. Do not play the amplifier if it exhibits these symptoms – get the bias adjusted imme­diately to prevent tube failure or other damage. If the locating notch on the base of a power tube breaks off, you should replace the tube. (Rather than take the risk of damaging the amplifier by incorrectly inserting the tube, it is less costly in the long run to consider it defective and unusable.) Protect the amplifier from dust and moisture. If liquid gets spilled into the amplifier, or if the amplifier gets dropped or excessively jarred turn it off, unplug it and have it checked out at a service center before using it. Proper maintenance and cleaning combined with regular trips to your service center will insure the best performance and longest life from your amplifier. Tube replacement should be performed only by qualified service personnel, familiar with the dangers of hazardous voltages which could be present when changing tubes! Do not risk exposing yourself to such hazards by performing tube replacements yourself if you are not qualified! Dana Sutcliffe and an employee originally designed the Alvarez Dana Scoop in his guitar shop in the late 1980s. Not to be forgotten are the people who worked at the shop during the guitar’s developmental years. Their support kept the dream and focus alive. The original prototype looked identical to the first production models except it had a reverse headstock and a steeper angle to the neck joint. The President of St. Louis Music (Alvarez is a division of St. Louis Music) had the creative vision to bring the product to the market place. His discovery of the instrument is a whole other story. The Alvarez product manager gave the guitar its name “The Scoop” after the instruments radical cutaway. The original name was the “Gash Guitar.” Thank heaven for marketers! Patent Pending production of the guitar was started in January of 1991. There were four Korean built models. Two of the instruments had maple necks and rosewood fingerboards. Their colors looked almost identical to one another, Metallic Blue and Black. A white model with a graphite neck was also produced. Lastly, there was limited production of an all-natural maple body and neck model. Many of those bodies were highly figured. All the bodies were made of sugar maple and featured Floyd Rose Licensed tremolos. The electronics featured two Dana designed pickups in a hum bucking single coil configuration. These ran in series with Dana’s Harmonic Enhancer electronics. Each instrument had one Volume and one Enhancer control. In 1992 Dana Sutcliffe and his partner were awarded a US utility patent for the guitar’s functional cutaway design. Earlier in 1992 the Alvarez Dana Scoop was voted “Guitar of Year” by Music and Sound Retailer Magazine. This coveted industry award is presented yearly during the Winter NAMM Show. The LA and Nashville Scoops were designed to conform to a more conservative guitar buying public. The smaller size Scoop was to accommodate the larger body mass. Even though the patent was granted on the basis of having improved access to the strings at the base of the neck, the true function of the Scoop was that it improved the instrument’s sustain and resonance properties. It eliminated phase cancellation between the neck and body resonance. The guitar body size determined the size of the scoop. The graphite neck used on early models and the Tri-Force Pickup used in later versions of the Scoop were produced against the designers’ wishes. Early production models never met the designers’ specifications 100%. Which is an even further testament of the Scoop’s resonating enhancement properties. Several years later the specifications on production models gained the designers’ praise.